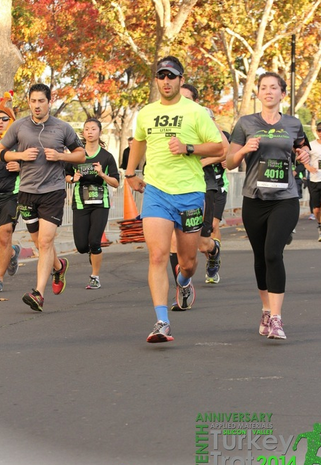 I’ll cut to the chase: with Jesse’s pacing help, I set a new 10K PR at the Silicon Valley Turkey Trot on Thanksgiving. 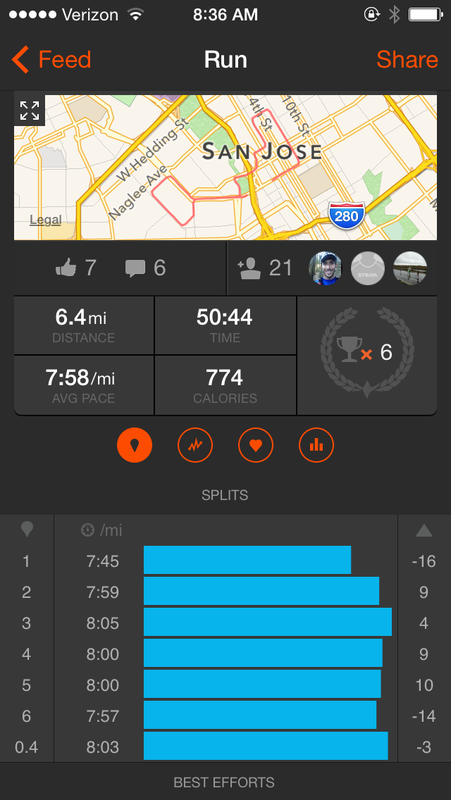 My official result was 50:49; according to my Strava, I ran 6.4 miles during that time and made it under 50 minutes. Either way, I’ll take it! 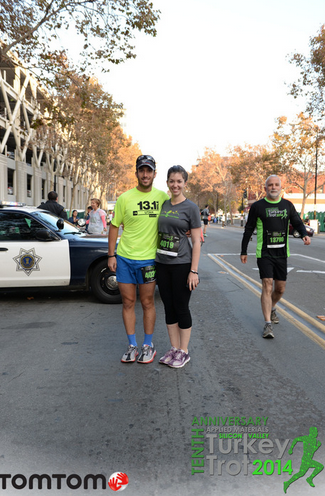 Before the race, Jesse agreed to pace me (at his slow marathon pace, mind you) around 8 minute miles. 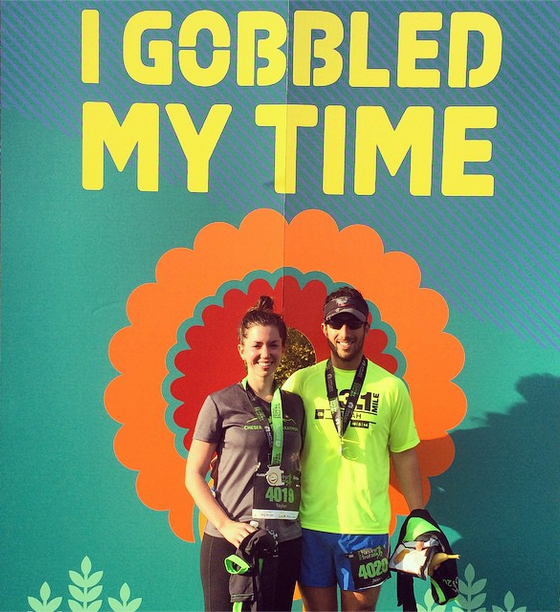 I wanted to run the 10K around 50 minutes, but I didn’t know if I could do it. Jesse was a fabulous pacer, putting up with my slightly surly attitude while maintaining an even 8:0x pace, and he paced me a bit faster at the beginning (unbeknownst to me) to take advantage of the first slightly downhill mile. Most of the race was completely flat. A disclaimer: every time I’ve ran a 5K or 10K it’s been under less-than-opportune circumstances. I’ve ran 11 miles and drank a few too many beers the day before these shorter distance races. 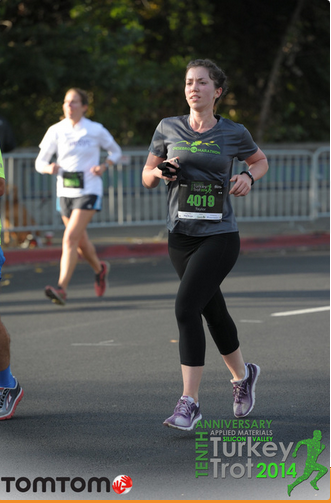 This was the first time when I felt good and normal going into a 10K. I placed in the top 6% of women ages 25-29. This speed is hopeful for February’s half marathon, where I’m looking to break 1:55. We spent the rest of Thanksgiving hanging out with family and friends and eating and drinking. Next stop: North Face! well done! congrats on PR AND feeling good. Nice job! I had trouble getting past all the double strollers and the people who were just goofing around. The first couple of miles were crowded! They were kind of crowded! We started way up at the front, which proved to be a good idea. Silly me! I read the wave signs and believed that people would follow them. I was in front of the 8:00/9:00 minute/mile wave and still wasn’t in the right spot. Next year, I’ll jump to the 7:00/8:00 wave start. I thought it was silly being in a wave that was way faster than me, but it actually helped us avoid much of the crowding (and we didn’t get in anyone’s way, either!). Nice job Taylor, congratulations on the PR. Congrats!! That’s an awesome time! Nice one. Congrats on a new PR! Awesome!! You guys are too cute!! Congrats on the PR! So exciting!!! I am sure you will get that 1:55 come February!! !